As you may know, part of my goal in writing this blog was to have a forum to process things I learn, and of course, to allow you to benefit from my nerdiness in learning. This week, many of my physical therapy colleagues from across the nation are traveling to Indianapolis for the American Physical Therapy Association’s Combined Section Meetings—basically a week of excellent presenters, networking, and seeing old friends. Of course, my heart is SO sad that I won’t be there this year—so I just had to find a way to learn on my own! Thankfully, Jessica Drummond clued me in on Twitter to the Becoming the Best Event– a week long summit of (FREE) interviews with top holistic health professionals in the country! I read the bios, and I was in. I have been following Jessica for years (Didn’t know you had a stalker, did you Jess? :) ) and I have truly enjoyed learning from her. 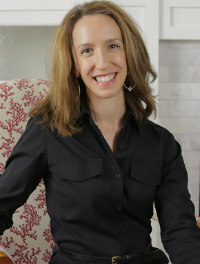 Jessica is a physical therapist and the CEO and founder of the Integrative Pelvic Health Institute. She has created a unique model of treating the whole person—managing the hormonal and dietary aspects as well as the physical—and she is pretty awesome at doing it! I was fortunate to collaborate with her this past year in caring for a wonderful woman who was experiencing sexual pain, and I can say from my experience that Jessica really did make a difference in her life! In treating women, Health Care Providers (HCPs) must work to normalize women’s health issues. We should all ask about a woman’s menstrual cycle and reproductive history the same way we ask about diet, bowel movements and sleep habits. For some reason, women are taught from an early age that our normal cycle is something to hide and be embarrassed about. However, it is so important and can be one of the only clues to us that something is off! Did you know that an abnormal menstrual cycle could even be an indicator of Celiac’s Disease? I didn’t, until today. What about high impact activities (running, jumping, gymnastics)? Not “bad” either but can put women at risk for problems if they do not understand how to adequately use their pelvic floor muscles. Increasing pressure on the pelvic floor without adequate timed recruitment can lead to problems like incontinence/prolapse. Jessica recommends that all athletic women should be mindful of their pelvic floors (not always Kegels!) and all HCPs working in wellness should ask questions and encourage seeking help when needed. Women often ignore the benefits of our hormonal cycles—we are always encouraged to hide it from the time we are 12 years old! Estrogen and testosterone are at its highest right before ovulation (2nd week in the cycle). Women actually have more energy at this time, and will burn more fat when exercising these days! We can capitalize on that by eating a higher fat meal a few hours before we exercise to encourage our bodies to burn more fat. So, at mid-cycle- we should eat less sugar, healthy protein and good fats to encourage our body to utilize the natural hormonal environment. In the second half of the cycle, the body actually prefers using protein as energy! If a woman has a big fitness event at the end of the cycle- she may need to eat more often and will probably need more support since hormone levels are at their lowest. And what about running with gels and gus? Jessica actually says that doing this does not encourage our body to use the right fuels but rather pushes a simple sugar energy. What about for pregnant women? There are some specific things that can be done to tweek a fitness program and get maximum benefits. First, it is important to recognize that the uterine environment is a very important environment to build. That environment can pre- program the genetic expression of the fetal genes. Weight issues, DM, PCOS, Metabolic issues can impact the environment. Clean eating (low sugar) with regular, healthy eating. Insulin sensitivity decreasing as pregnancy progresses can lead to big blood sugar swings which are also not ideal for womb environment. Eating healthy foods at regular intervals can help- focusing on eating nutrient dense foods, healthy fats and minimal sugars. Exercising (even just walking 30 minutes per day) can also help to control blood sugar and promote healthy blood sugar for the baby. Of note, pregnant women should be careful of actively detoxing during pregnancy and while nursing. Stored toxins are “hidden” from the baby and trying to “release” them can actually transmit those things to baby. That being said, a more intense detox before pregnancy can actually be a good thing. And lastly, what about us health care professionals? How do we avoid adrenal burn-out? It is essential for us to create a fairly strict list of priorities focusing on our vision for our life: What do you want life and work to be like? What must your health be to support this life? Jessica encourages prioritizing self-care and in an oh so inspiration way, encouraged us to “Be an inspiration for patients rather than being the person resposible for ‘fixing them. '” She also encouraged eliminating the guilt we often feel from being unable to cure everyone. She said, “You are not everyone’s healer.” We cannot heal everyone, but there are specific people out there who need our specific skill sets. Our goal should be to provide the knowledge, wisdom and skills patients need to allow themselves to heal. When they see us as an inspiration, they will take the responsibility to own their healing, wellness and healthcare. And this is a total mindset shift! We don’t have to feel guilty when we cannot help someone! And this frees us to really be what we need to be for the people who need us. Thanks so much Jess for all of this great information! Please check out Jessica’s website for more information about her and the awesome work she is doing! If you would like more information on the Becoming the Best Event, please feel free to check it out here! You can access all of the interviews for free for 24 hours after they air, or you can pay $97 to access them whenever you would like!